A tasty and catchy appetizer, excellent in every season but especially appreciated in the summer because it is fresh and light. It is easy to prepare, and allows infinite variations, so you can adapt it to your taste or what you have at home without any problems. Our recipe uses cottage cheese, but any cream cheese will do (goat ones are excellent!). 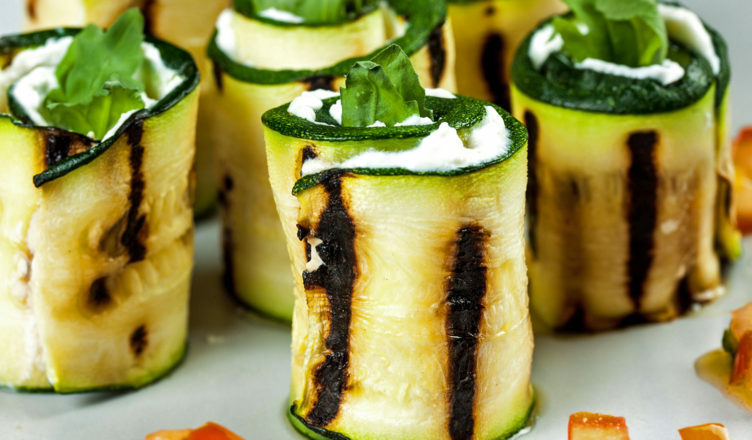 Quickly grill the zucchini, or place for 10 minutes (no more) in a very hot oven or four minutes in the microwave; if you’ve cut them cut finely you can also leave them raw only softening them for an hour in a marinade of olive oil, lemon and salt. You can dress the cheese as you like: with your favorite herbs (including a little bit of garlic if you like), with almonds or pine nuts or walnuts, green or red pepper, balsamic vinegar and more. Enjoy.